Named a 2010 Outstanding Academic Title by Choice magazine! Worship in the Early Church is a four-volume collection of excerpts from early Christian writings illustrating the Church's liturgical practice in both East and West, from its Jewish beginnings through the end of the sixth century. This CD-ROM includes the content from each volume in one convenient PDF file. This PDF version is supplied as part of a PRINT/CD-ROM package and is also available separately. Once the seal is broken, this CD-ROM may not be returned. Use of this CD-ROM is subject to certain restrictions and limitations under the license agreement contained within the CD. System Requirements: Adobe Reader 7.0 or higher version is required before accessing the source material on this CD-ROM. Lawrence J. Johnson is the former executive secretary of the Federation of Diocesan Liturgical Commissions and the former editor/director of The Pastoral Press. He has written several books on the liturgy and its music, including The Mystery of Faith: A Study of the Structural Elements of the Order of the Mass. Worship in the Early Church will provide a useful overview of the commonalities and differences in worship traditions within the Church, not only across time but also across space. . . . To discover these early writings on worship is to discover a spirit that has been lost in our modern age. For Christians to appropriate that spirit would connect us much more strongly to the Early Church and to the teachings of Christ than any given liturgical practice. The layout and format are clear, the bibliographies substantial and helpful, and the translations straightforward and accessible. This will be a helpful resource for those without access to original languages and critical editions who are looking for a good, brief orientation to important sources of liturgical study in the first six centuries. Worship in the Early Church transforms a rich store of liturgical tradition into a readily accessible reference set. This work is highly recommended for libraries with strong theological collections. They will serve as valuable tools for serious research in the future. This work has been long awaited in many quarters. . . . This set will be of immense practical value for a variety of audiences. Highly recommended. 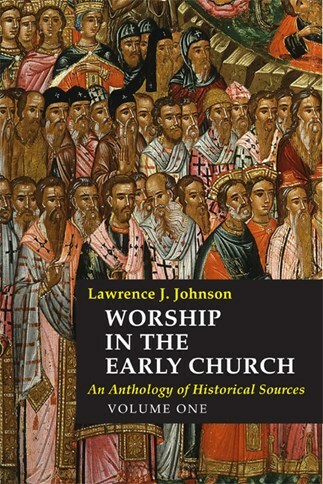 Lawrence Johnson has accomplished the near impossible in this four-volume anthology of early Christian liturgical texts and other patristic documents related to the study of early Christian worship in the first six centuries of the Church. This collection is comprehensive in its cope and wide in its breadth. . . . There is not another collection like it in English. The project looks tremendous . . . eminently usable for classroom purposes. This is a volume that can be used and used for years to come. . . . A much-welcomed product. Worship in the Early Church is a rich treasure trove of source materials for those who study early Christian worship. This anthology gives them access to English translations of a wide range of ancient sources that may not be otherwise available to them. The author, who studied under Pierre Marie Gy and Pierre Jounel at the Institut Catholique in Paris, has done scholars a great service in providing these translations, the majority of them his own. Johnson's comprehensive bibliography, with entries covering the past century and a half, will be a welcome bonus for those wishing to trace the development of scholarship on these early documents. A truly remarkable and indispensable resource! This set will be a great resource. I was impressed with the thoroughness of Johnson's bibliography and his attention to detail. In addition to scholars in the area of worship or liturgy, this collection could also serve those in theology and historical theology. . . . It could have significant ecumenical appeal. It will be very useful to have all these texts in one location. The ability to search and to cite directly from a disk will lighten the task for authors. The bibliography is very useful and the translations are excellent.